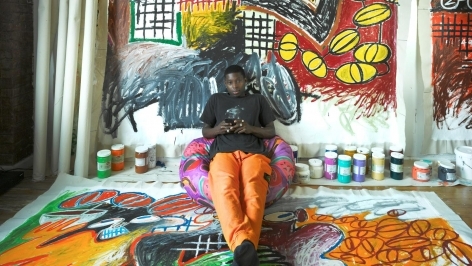 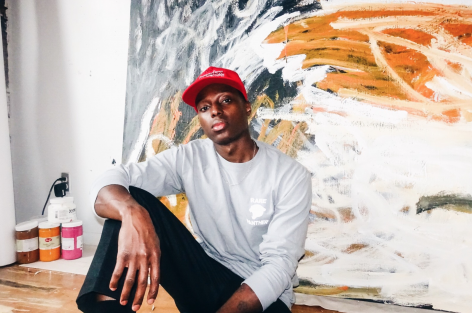 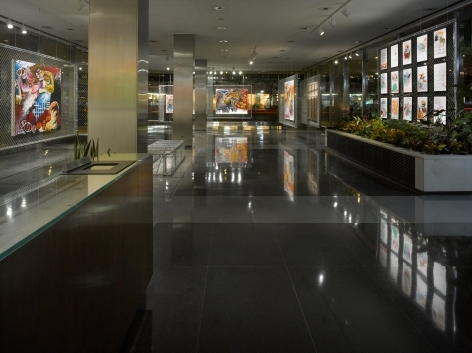 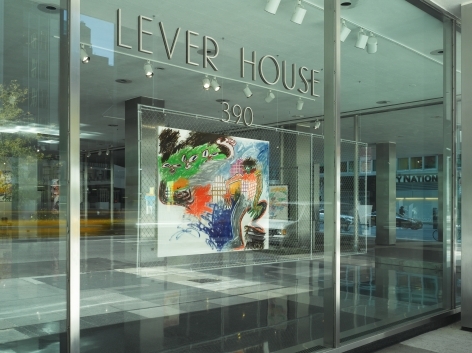 The Lever House Art Collection is pleased to present Premonition, a solo exhibition by Brooklyn-based artist Reginald Sylvester II (b. 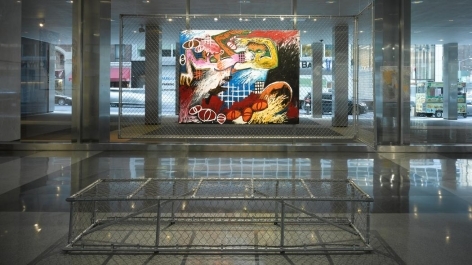 1987, North Carolina). 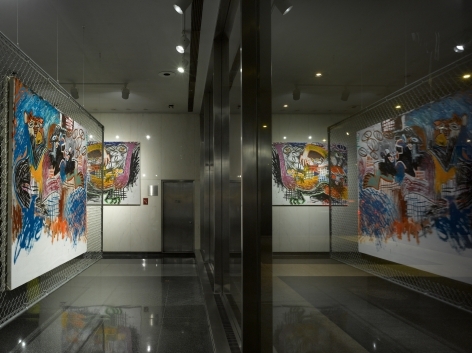 The exhibition delves into contemporary themes of identity, youth culture, and references to biblical scriptures in a raw and lively manner. 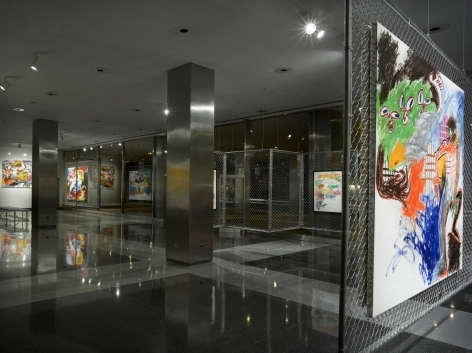 The show’s colorful figurative paintings reveal themselves through the artist’s dreams as well as daily life – in moments of haste or inspiration, and reflect his struggle and torment in unveiling his true self. 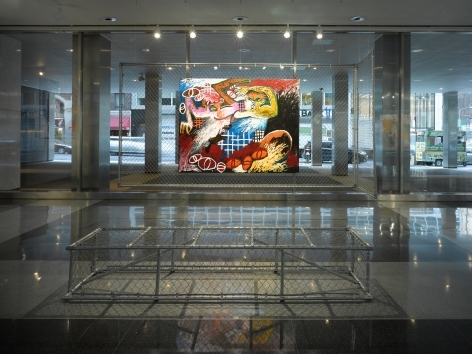 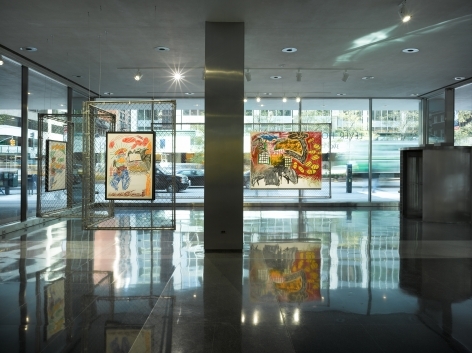 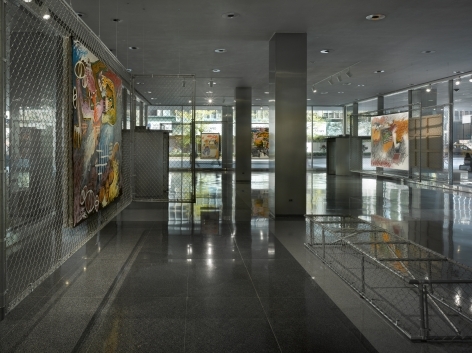 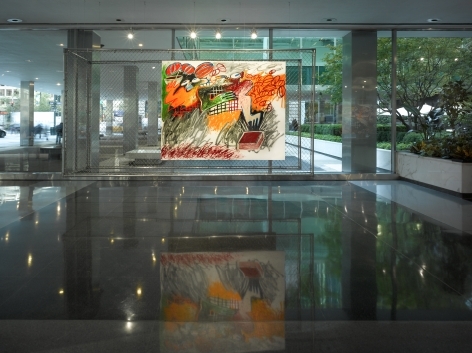 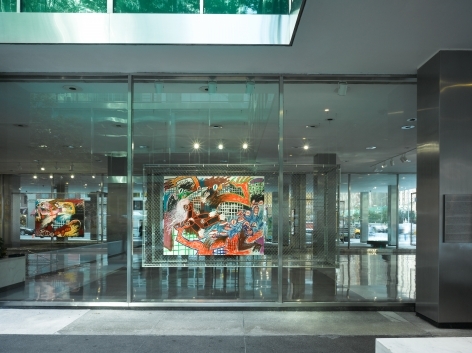 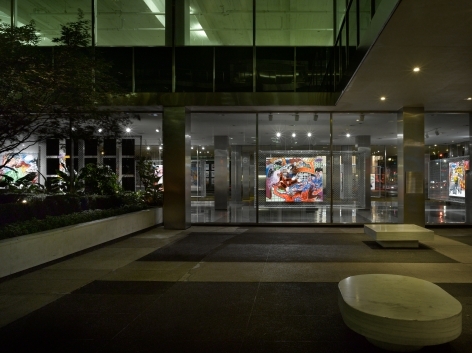 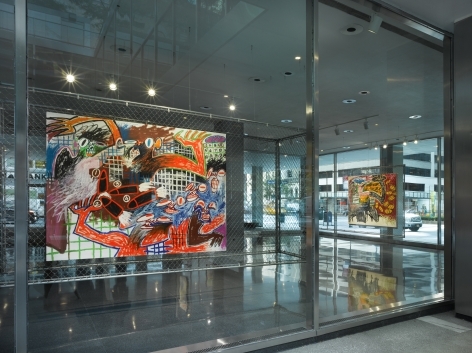 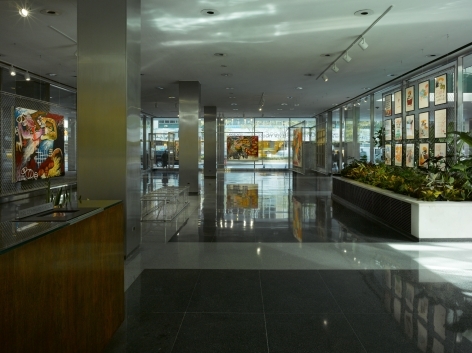 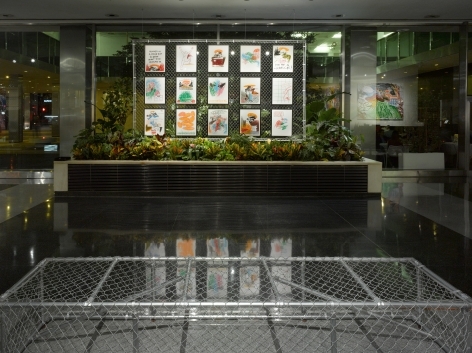 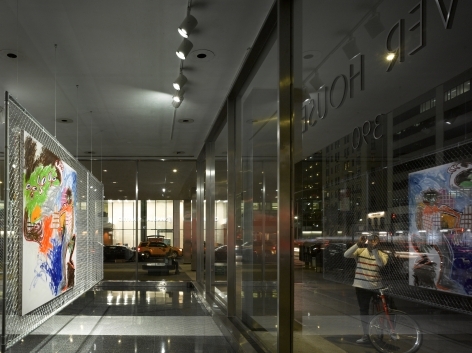 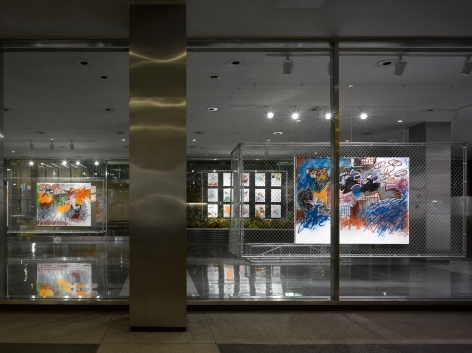 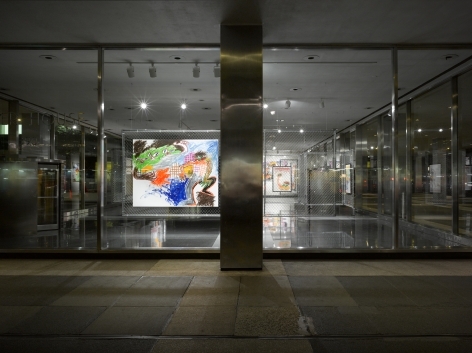 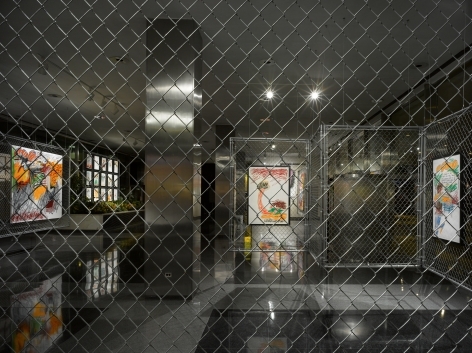 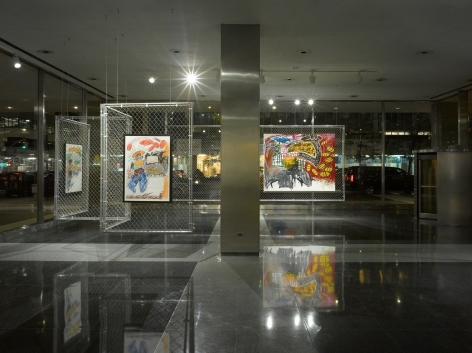 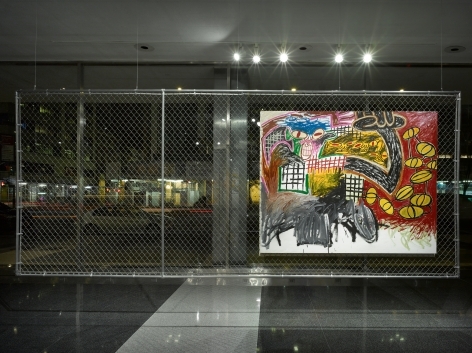 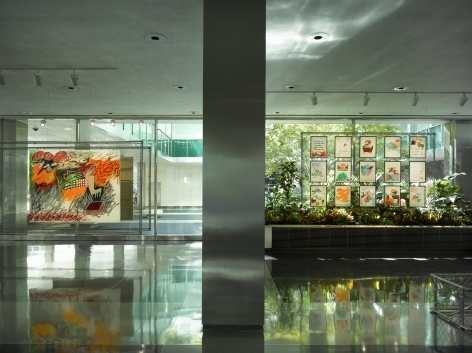 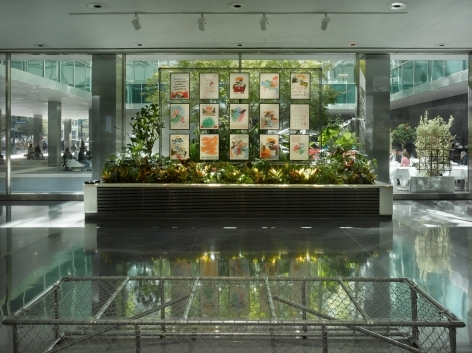 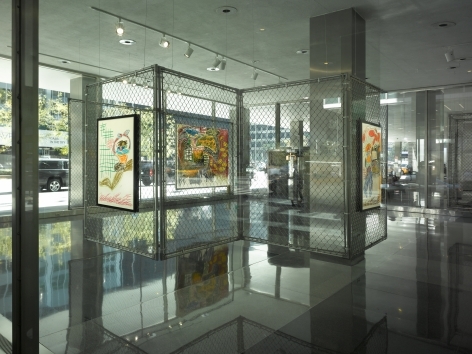 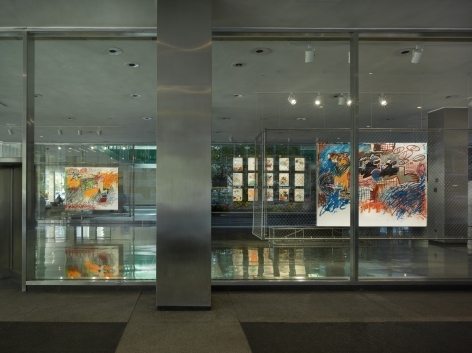 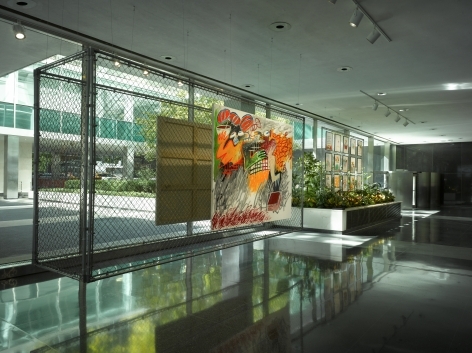 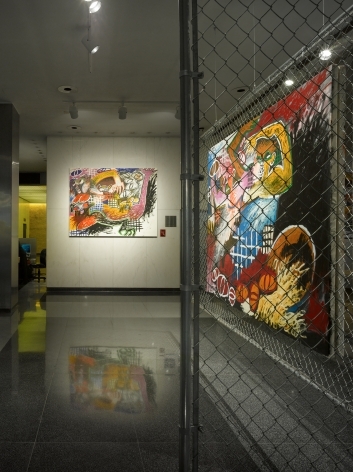 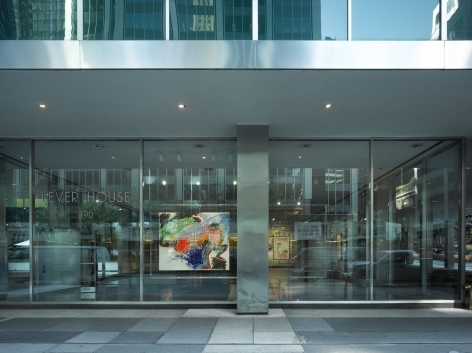 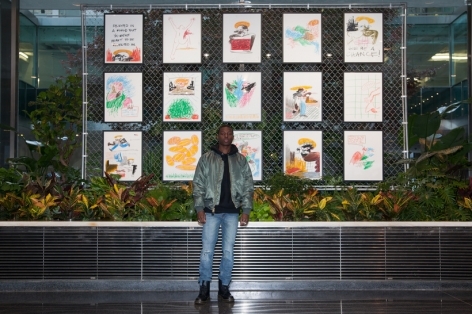 Sylvester II’s canvas and fence installation brings the rugged environment of downtown Brooklyn to the clear-cut space of Lever House, breaking the mold of the architecture whilst decontextualizing its identity. 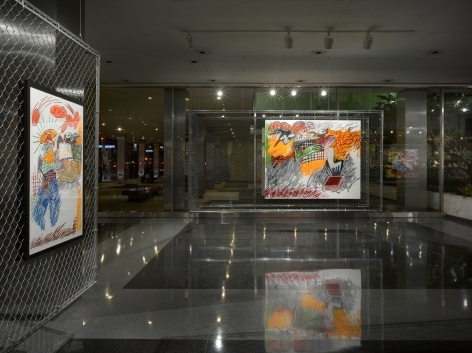 The exhibition introduces eight acrylic works on canvas, as well as a series of oil crayon sketches. 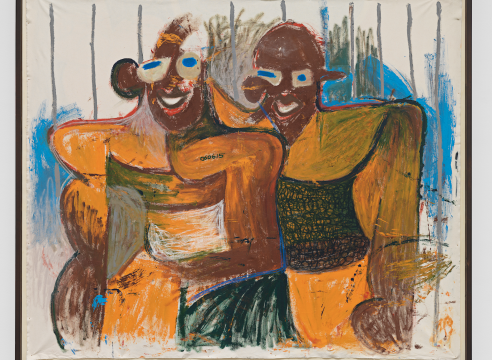 Built up of innumerable layers of vibrant hues and pigments, the works displayed in this show illuminate the artist’s repertoire of energetic gestures, textural depth and chromatic radiance. 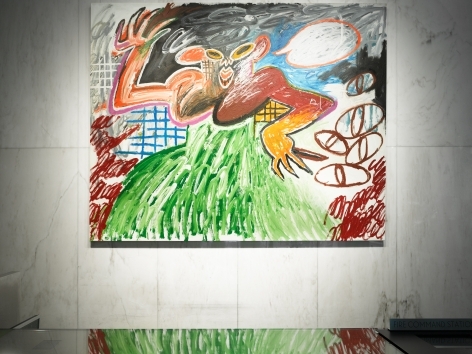 It is through this journey that Sylvester II articulately depicts his view of the world – achieving powerful proclamations of everyday life and trapped personal affliction that consume the viewer’s gaze in an impenetrable turmoil of electric charge. 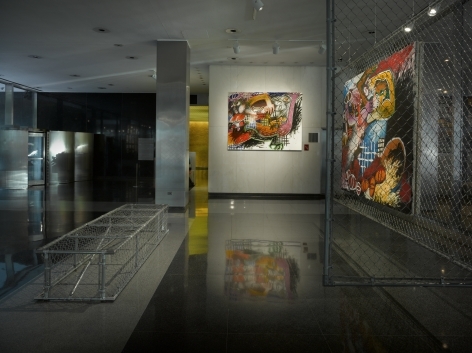 The works are surrounded in a barrage of arresting iconography, connected through repetitive imagery such as the biblical references to chariots and the fences that point to feelings of imprisonment as well as the state of the world today. 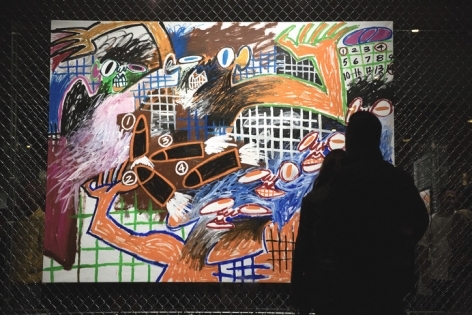 In Premonition, Sylvester II’s paint application conjures a sense of organized chaos through violent yet controlled movement, which is meticulously rendered with rich layers of painterly gestures and complex arrangements. 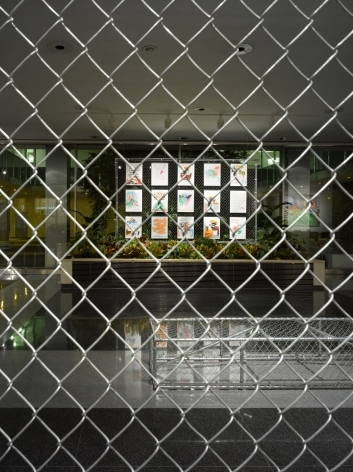 In this work, the artist evokes a dystopian future that leaves the viewer with a hostile foreboding and disheartening feeling of what is to come.